IMAGE: Vineet and Zoya Hussain in Mukkabaaz. Vineet Kumar Singh let go of a secure, well-paying job of a doctor -- he has an MD in Ayurveda -- to chase his dream of becoming an actor. Of course, that's an uphill task, and Vineet went through 14 years of struggle. He did bit roles in Hindi films, a Bhojpuri serial, a Bengali film and a few days' work in a Marathi film. He's worked for as little as Rs 500, hoping to get noticed even in a single scene. He's been shooed away by watchmen at directors' and producers' offices. Despite being a distant cousin of Anurag Kashyap, Vineet couldn't land a meaty role, and had to be content with small roles in Gangs Of Wasseypur, Bombay Talkies and Ugly. So it was a big deal when he finally got a break -- and a central role -- in Mukkabaaz, a film which he haS written the script for. When Vineet saw big names like Aanand L Rai's Colour Yellow Productions, Anurag Kashyap's Phantom Films and Eros International on the Mukkabaaz clap board for the first time, he got emotional. "Yeh meri aukaat nahi thi. Main bhagwaan se aur kya mangu? (This is not my status. What else can I ask of God?)" he asks. He had expected to start off with a smaller film and didn't expect it to get so big. Vineet, who will be seen in Gold with Akshay Kumar next, shares his Bollywood journey with Rediff.com's Jahnavi Patel. IMAGE: 'The training was very difficult,' Vineet says. Mukkabaaz has been appreciated in India as well as at film festivals. I would like to share a reaction when the film was shown at TIFF (Toronto International Film Festival). A 70 or 75-year-old couple loved the film so much... the way they expressed their feelings was quite a surprise. Even at that age, they could relate to the film. Youngsters will love the film, but I hadn't expected this. Even in Mumbai, at MAMI, we saw the same reaction. A lot of people said they couldn't understand some of the dialogues because there was so much whistling and clapping. How did the story fall in place? I was not getting the kind of work I wanted. I came to Mumbai in 1999 or 2000. Anurag sir and I are from Banaras. I knew him, but did not go to him right away because I knew that if you go to him with any reference, he will shoo you off. I had to get good work before I went to him. But I didn't have work and had nothing to say. I had done a film Pitah, which flopped. I am a doctor with no connection with the film industry. It took me 10 years to get work. That's when Gangs Of Wasseypur, Bombay Talkies and Bollywood Diaries happened, and no doubt, a lot of things changed. But I was getting similar kind of work. I realised that what I wanted for myself was in my head and what people wanted out of me was different. So I thought of writing. In the beginning, I wrote with my sister and a friend. Then, my friend got busy with something else, and my sister and I made drafts. The film was based on boxing. I have been a national level basketball player. I have played five, six nationals and have seen a lot of international players since childhood. I have also seen players who were good, but nothing happened to them because they couldn't be in anybody's good books or because of family pressure. I started boxing training after I wrote the script. I thought the film would be made in a year, but three years went in making people just listen to the script! I had just one condition: That I would play the central role. Then I thought of going to Phantom Films and narrating the script to Anurag sir. Sir read the script and called me. That phone call has been the most important call in my life. He said he would direct the film with me in it. I couldn't believe my ears! He laid down two conditions: If I didn't become a boxer, he would not make the film. Secondly, he would develop the script in his way. I just handed over the script to him. 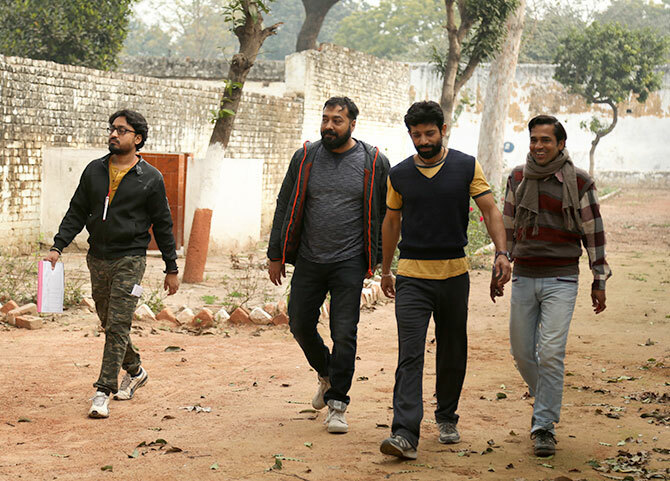 IMAGE: Anurag Kashyap and Vineet on the sets of Mukkabaaz. I didn't have money, so I had sold whatever I had and went to Patiala for training for a year. After that, I returned to Mumbai. The pre-production work was going on, so I had some time. Sir gave me his entire house and I would train for eight hours. He (Anurag Kashyap) had asked me to lose weight for Wasseypur. I was fat then and I lost weight for the role. Here, it was not about body building, it was about boxing. People think it is physical, but it is a game of intelligence. Your mind should be sharp to take decisions in the ring. Boxing is about speed, stamina, intelligence and power. I started with running and gymming. Anurag sir spoke to (Olympian boxer) Vijender Singh. He spoke to coaches. I trained at a centre where Harpreet Singh, one of the coaches for the Indian team, was there. It was very difficult. Teen-chaar mahine toh sirf maar kha raha tha mein (for three, four months, I was just getting beaten up). Initially, what worried me was that if I send this video (to Anurag Kashyap), the movie wouldn't get made. So I deleted all the videos. 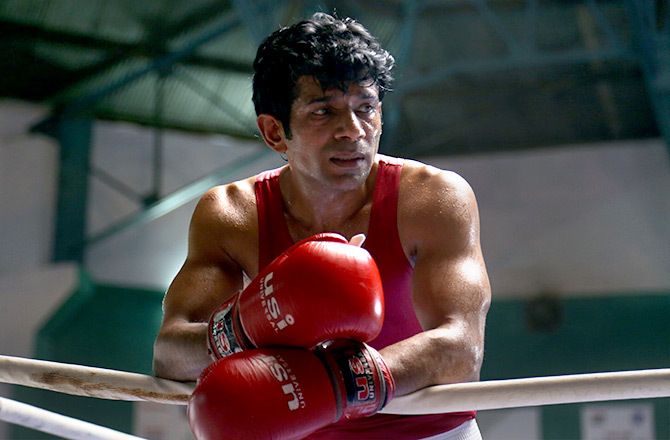 Later, the Spirit of Mukkabaaz (a video on Vineet's training and transformation) was released. What's it like working with Anurag Kashyap? I had to unlearn what I had learnt. He improvises a lot, gives so much freedom. I felt like that kid who gets tossed in the air by his father. I did not have a fear of falling. You wrote the lyrics for the Paintra song. One day, sir called me and said he wanted a desi rap. He wanted something like what I had written for Ugly. I told him I didn't want to write. So he called me over. He started talking and whatever he said was exciting. I realised that I had seen a lot of those things. I switched on my phone's recorder, and he said a lot of things. Unhone ek alag chashmah diya mujhe (he gave me a new way of seeing things). I came back with the words and thoughts. For two days, I just heard the recording and wrote down the nice words from there. On the third day, I wrote the song in 15 minutes. I showed it to sir and he liked it. He then gave it to artistes Nucleya and Divine, and they made some changes. 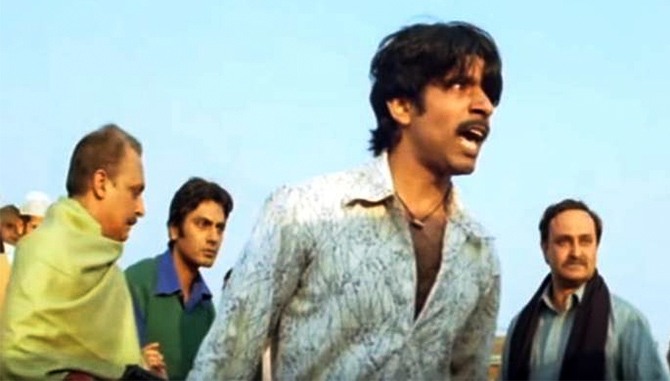 IMAGE: Vineet in Gangs Of Wasseypur. Is Bollywood an easy place to survive? I see good in everything, embrace that and then move ahead. I didn't have a place to stay here. I would hide and stay in the medical college. When the warden would come, I would run to the terrace. I would count my rotis and eat. I would get calls from my friends for their hospitals' inaugurations. I broke my sister and brother's insurance policies. Whatever savings I had got over. I was struggling for work. I used to struggle for Rs 500, Rs 1,000. I am thankful to Anurag sir and Aanand L Rai sir for trusting a boy like me, who came from a small town with a small dream, someone who isn't from an acting school. Why did you think of becoming an actor? I like acting. Even when I was small, I liked it. My father is a mathematician. Everyone at home is in the teaching profession. So, I didn't have any connection (with this industry). After gathering a lot of courage, when I told my father (about wanting to act), it was a stern no. My younger sister and brother supported me secretly. They were my critics and admirers. In medical college, I would participate in cultural functions. That's when I started wanting to become an actor. Watch out for Zoya Hussain, folks!